An interview with Umberto RiccettiWhat influenced the artwork behind Next Generation? Hi Umberto, thanks for speaking to us! Very well and thank you for speaking to me as well. How are you, and where are you right now? I'm actually sitting in a local Italian bakery and Café in town enjoying a cappuccino and biscotti, it's not every day a legendary drum and bass record label out of the UK wants to interview me. In previous interviews, Bensley has mentioned that you knew eachother before you designed the artwork for his recent LP. Could you tell us your background with Peter? And when did you first find out he'd been signed to Ram Records? The first time Bensley and I met was at a hair salon I work at , I started cutting his hair on a regular basis and from there we developed a friendship and conversations always revolved around music. I first found out he got signed to Ram was on one of his haircutting appointments I was like whaaaaaaaat I was so happy and excited for him truly. 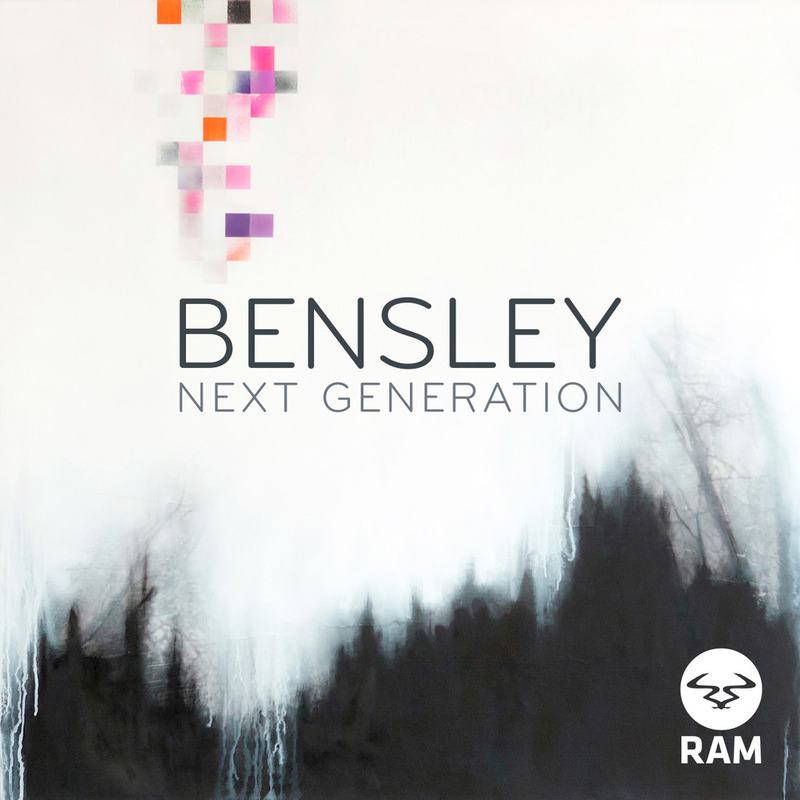 When did you first hear Bensley's music? Are you a fan of drum & bass? And what other genre's do you listen to? Bensley dropped by the studio with the demo he was working on and wanted me to hear it, I'm actually proud to say I was one of the first people to hear his music and I was blown away and thought to myself wow this kid’s going places and it couldn't of happened to a more genuine and creative individual. Yes I am a huge fan of drum and bass. I still like to refer to it as jungle though. I was born and raised in Toronto until the age of 10 then my family and I moved to a suburb of Toronto called Scarbrough and at that time we're talking late 80s early 90s there was a big mishmash of cultures predominately Jamaicans (p.s if anyone's visiting Scarbrough you need to check out Patty King The best beef patties and Coco bread Big ups). Anyway at that time there was an indie record store down the street from where I lived, and there I was introduced to early jungle and dancehall, it was the coolest place to hang out. I'm just a fan of music I listen to whatever moves me. Aside from my newly found love for dancehall and jungle I listened to a lot of post punk New wave bands like Joy division. Echo and the Bunnymen, The Jesus and Mary chain, Susie and the banshees, The Cure, Toronto's own Martha and The Muffins, Yaz, The Smiths, Human league etc. I just love that stuff, it never gets old for me. Some of the bands that I obsess over now are the Brian Jonestown massacre of the Dead skeletons, Baby Shambles and Pete Doherty he's the real deal,Toronto punk band Teen Anger another Toronto band Crystal castles who recently split up (bummer!). Oh and I really like UK band Savages they're really great (I could answer this last question for days by the way!). In my art studio I listen to one band and one band only and they are called the Brian Jonestown Massacre it's hard to put into words the way their music affects me but it just does, powerful stuff! They are a psychedelic rock folk shoegaze, they are really great.The piece that was used for Bensley's album actually came to me in a dream like most of the art that I do, I sleep with a sketchbook nearby and try to put a rough sketch on paper and revisit it in the studio. The album artwork is certainly unique! What was your idea around it? Was there a particular track that helped you to develop the idea? I really don't have any background in the visual arts. I'll take you back to how this all started for me when I was about 19 years old I was diagnosed with Hodgkin's lymphoma a form of cancer, it was a crazy time, this is something I rarely talk about I don't even think Bensley knows about me. But anyway I guess when you put yourself out there it's good to be honest and don't hold back, during this time I was going through six weeks of chemotherapy, and had my then high school sweetheart and now wife by my side every step of the way. During my treatment I remember going to a happy place in my mind I would envision beautiful colors and images, childhood memories and for some reason after my treatments were over and got a clean bill of health I went over to the local art supply store and bought a bunch of paint and canvases and just started painting. It kind of freaked me out that this art stuff just came naturally to me and my family and friends thought I was possessed or something. I don't know maybe I was haha! I truly feel getting all of my built up emotions and anxiety of my then illness out in the form of art was an intricate part of the healing process. I just needed to express myself and from there on and I just haven't stopped . I also dabble with playing music. I'm obsessed with analog synthesizers and drum machines I've got a few. Maybe one day Bensley and I will record something start a band or side project or something that's the ongoing joke we have, for me playing music is just hobby and a fun one at that. And lastly, what's the music scene like in Toronto? Are there any places in particular you like to spend your weekends?